It had to come at some point. 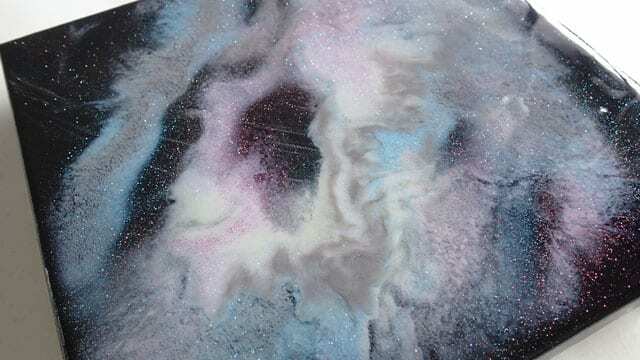 With my love of glitter and all things sparkly it was only a matter of time before I wanted to add it to resin ( a lot of it) and try to create a resin painting. Of course, it didn’t go entirely to plan! These things never do. These paints are SO bursting with glitter that when it came to thinking about what I would want to use for my first resin painting, well, there wasn’t any contest! Or so I thought. Of course, being my first time and not having read up about it to any great extent, it didn’t wholly come out as I had expected, but I’m still in love with all that glitter. Hmm, so there. Those glitter paints might be awesome in pours but they really didn’t quite work as expected in the resin. I checked out a few resin art groups and asked about them and it seems I’m not alone. It wasn’t something I did wrong, it’s just the way these paints react with resin. However, they cloudiness did fade a little bit and lots more of the glitter showed through once the resin was cured so I was happy. What do you think? Should I leave this one as it is, or try another layer of resin with some different pigments or glitters or paints? As usual, here is a slideshow of photos from this project, both wet and dry and closeups of the details. 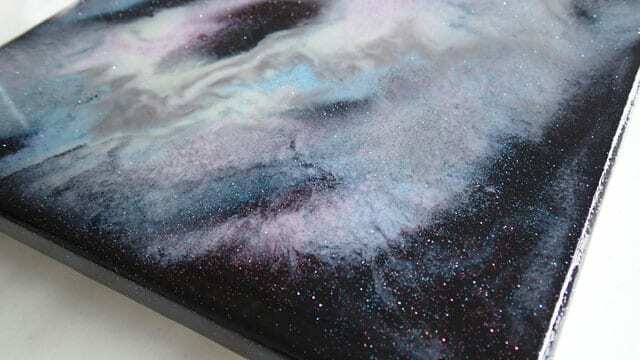 I thought your resin pour painting turned out absolutely gorgeous! The glitter in your paints really made it just striking! I am new to the pour painting craze & now I’ve realized there’s so much more fun waiting for me!! Thanks Deby! I’ll keep watching! I’ve never been that crafty but since finding success with pouring, I’m keen to give lots of things a try now. Who cares if I make a masterpiece. So long as I enjoy trying, that’s what is important. Beautiful results! What is your recipe paint to resin? I would like to see more resin. I didn’t have any exact recipe, I just eyeballed it. I’ve heard that you shouldn’t add more than 10% of paint/colorant to the resin or it can affect the curing. Your ratio appears to be perfect! I love your experiments! Keep them coming! Loved this video, I think I will buy some resin to experiment with. Hi Deby.. I just love the way your resin turned out . You are right!, very Galaxy looking. Beautiful and the glitter is excellent. So Heavenly!!! LOVE IT!!! 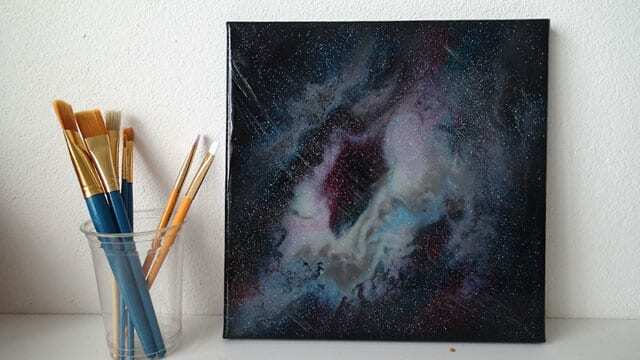 This painting looks like one of those pictures taken by the Hubble Space Telescope of a far-off nebula. Every piece of glitter is a star in the sky! Truly gorgeous! Now I’m looking forward to playing with resin and glitter. 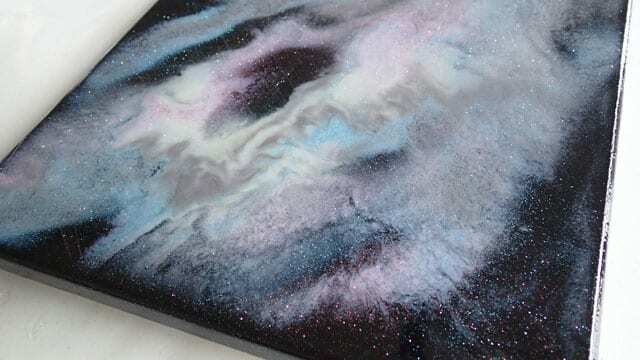 Think your first resin pour is beautiful, looks just like a very starlit sky. Although the colours are not as bright as you expected, the tourmaline and the turquoise are lovely milky colours, although unfortunately the lime green is not so evident. But overall an ‘unexpected’ success. Yes, happy to see more resin pouring as well as acrylic pouring. Makes an interesting change! Deby I love all those experiments, but I think and that is my own opinion that the glitter is a bit too much, I try to do the same thing, but with some colors without glitter and those cells, I will see and send it by. With us in Belgium it is now 17h48 in the evening. 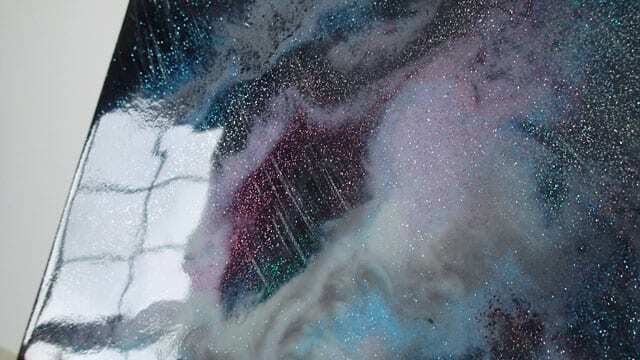 Love your resin galaxy pour….and would very much like to see more resin demos! Thanks so much, Deby! I loved your glitter pour. I can’t buy good glitter paints in Australia, do you think adding fine glitter to the paint would work? If you add it to resin, like in this example, yes it would be great. But adding glitter to paint doesn’t seem to really work. 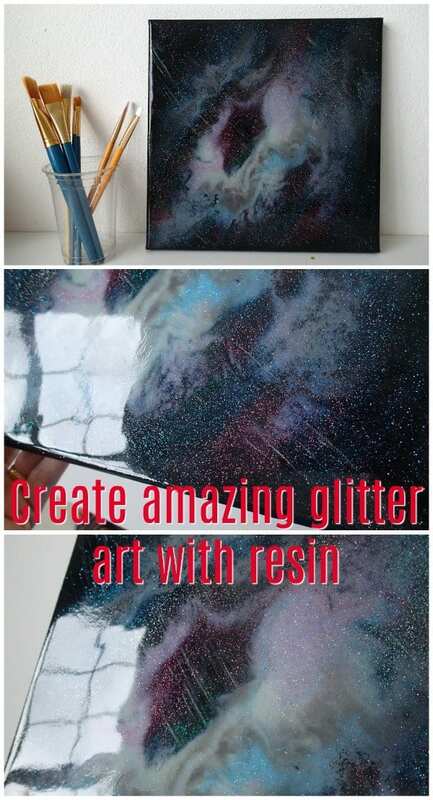 The paint just coats the glitter and it disappears. 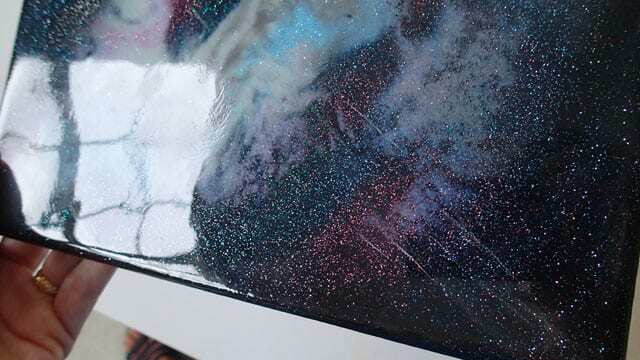 You can however sprinkle glitter on top of the wet paint once the painting is finished. Thanks Deby, I will give it a try. 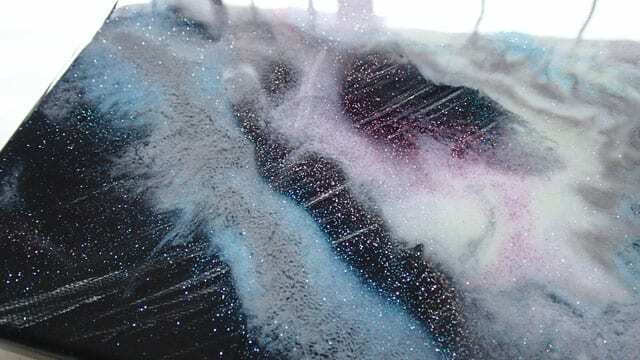 Just wondering.. how about doing a regular pour with glitter paint, let it dry, then pour the resin as a top coat. Wouldn’t that preserve the color?